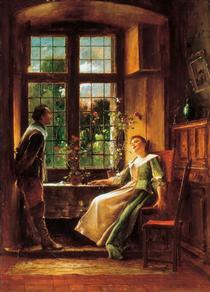 Mihály Munkácsy (20 February 1844 – 1 May 1900) was a Hungarian painter. He earned international reputation with his genre pictures and large-scale biblical paintings. Munkácsy was born as Michael Leo Lieb (Lieb Mihály Leó) to Mihály Lieb, an bureaucrat of Bavarian origin, and Cecília Reök, in Munkács, Hungary, Austrian Empire, the town from which he later adopted his pseudonym. After being apprenticed to itinerant painter Elek Szamossy, Munkácsy went to Pest, the largest city in Hungary (now part of Budapest), where he sought the patronage of established artists. With the help of the landscape artist Antal Ligeti, he received a state grant to study abroad. In 1865, he studied at the Academy of Vienna under Karl Rahl. In 1866, he studied at the Munich Academy, and in 1868 he moved to the Kunstakademie Düsseldorf to study with the popular genre painter Ludwig Knaus. In 1867, he travelled to Paris to see the Universal Exposition. After his Paris trip, his style became lighter, with broader brushstrokes and tonal colour schemes - he was probably influenced by modern French painting seen at the Exposition. In his early career Munkácsy painted mainly scenes from the daily lives of peasants and poor people. First he followed the colourful, theatrical style of contemporary Hungarian genre painters (e. g. Károly Lotz, János Jankó), for example in The Cauldron (1864) or Easter Merrymaking (1865). 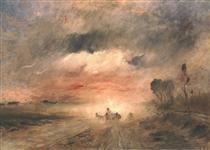 In the next years he paid more attention to the landscape around his figures (Storm in the Puszta, 1867). 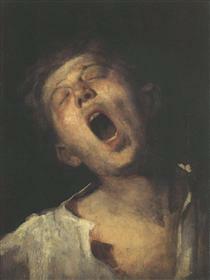 From the Düsseldorf genre painters he learnt to represent different emotions in his figures and to treat them as a group (The Last Day of a Condemned Man, 1869). 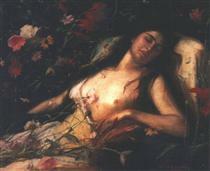 He is associated with the Düsseldorf school of painting. 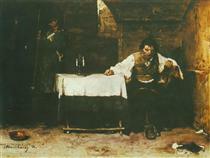 In 1869, Munkácsy painted his much acclaimed work The Last Day of a Condemned Man, considered his first masterpiece. 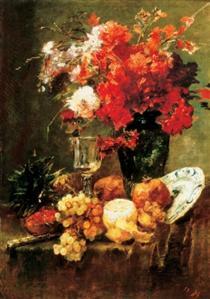 The picture was rewarded with the Gold Medal of the Paris Salon in 1870. 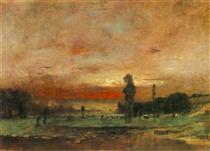 It made Munkácsy a popular painter in an instant. It suggests torture caused by oppression, moral uncertainty and reactions to an impending tragic end in visual form. However, it aptly captures the capabilities of the Hungarian master in painting. 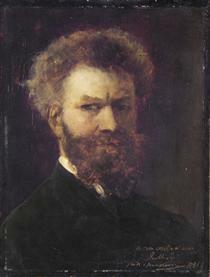 Munkácsy, together with his friend, the landscapist László Paál, moved to Paris, where he lived until the end of his life. 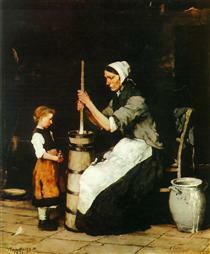 He continued to paint genre pictures like Making Lint (1871) and Woman Gathering Brushwood (1873). 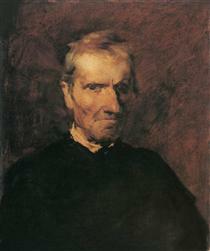 The zenith of his career was between 1873 and 1875, when he painted Midnight Ramblers, Farewell, Churning Woman, and Pawnshop. He married the widow of Baron de Marches in 1874, after which his style evolved; departing from the typical subjects of realism, he produced colourful salon paintings and still lifes. 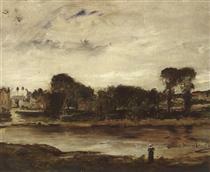 In the late 1870s he also worked in Barbizon, together with Paál, and painted fresh, richly coloured landscapes, such as Dusty Road, Corn Field, and Walking in the Woods. 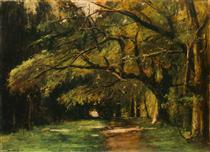 The assimilation of László Paál's style is apparent in the landscapes painted during the 1880s, such as Avenue and The Colpach Park. 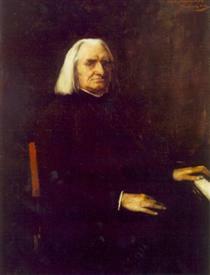 His realist portraits, including of Franz Liszt and of Cardinal Haynald, were also made during this time.